Designer hotel chain for budget travellers in Germany. Modern, clean and good value for money. Located between the two gay areas in the city centre, Rudolfplatz and Old Town. Soundproofed rooms, free Wi-Fi and a well-stocked bar are features of this hotel in Cologne. It is located just 1.6 km from Cologne Cathedral, one of the city's main attractions. 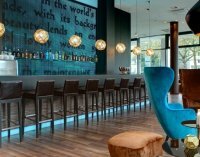 Guests can choose to order a breakfast at the Motel One Köln-Waidmarkt. A variety of drinks can be enjoyed at the hotel's bar. Cologne Messe Exhibition Centre is 4 km from the hotel. Severinstrasse U-Bahn Metro Station and Poststrasse U-Bahn Metro Station are both located within 500 metres of the hotel, and offer connections throughout the city.